Rare are the times when Illinois has pulled up the stakes on its traditional third Tuesday in March primary to move elsewhere on the presidential primary calendar. In fact, the only time in the post-reform era legislators in the Land of Lincoln shifted what is called the general primary -- a consolidated primary that includes the presidential primary -- was ahead of a cycle when a favorite son was seeking the Democratic nomination. While other states are moving around from cycle to cycle, that just does not happen in Illinois. 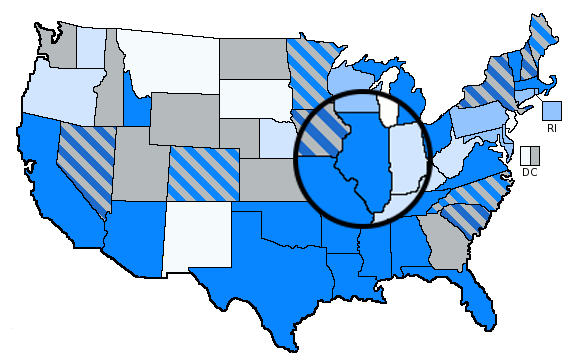 Like other states, Illinois is a victim of the same negative inertia of traditional fixed primary date. However, that has not stopped Illinois state Representative Scott Drury (D-58th, Highwood) from proposing legislation in the last three sessions to push the general primary back from March to the fourth Tuesday in June. Drury raised the issue in 2013 and again in 2015. And a similar bill -- HB 334 -- was introduced for a third time in 2017 and met the same fate: being referred to committee following introduction, where it died. The intent of this is less about the presidential primary tethered to the general primary and likely more about shortening the general election campaign for all the other candidates nominated for state and local offices across the state. But a fourth Tuesday in June Illinois presidential primary would have implications. It would place the contest in the same position as the back up option in Utah. And while that worked for the Utah GOP in the 2012 cycle, that position on the calendar is now non-compliant with the national party rules on primary and caucus timing. The fourth Tuesday in June is too late on the calendar, falling outside of the window in which states can conduct primaries and caucuses. This June primary idea keeps coming up in Illinois, but legislators have not gravitated to it in the past and likely will not in the future (should it come up again in 2019). The Illinois bill has been added to the FHQ 2020 presidential primary calendar. Midway through the 2017 session of the West Virginia legislature then-state senator, Jeff Mullins (R-9th(A), Raleigh) introduced SB 33. The intent of the bill was to uproot the biennial state primary -- which includes the presidential primary every fourth year -- from its traditional second Tuesday in May position to the second Friday in February. Although the bill was referred to the Senate Judiciary Committee for consideration, it was never taken up by the panel. It never received a hearing and languished there the rest of the session. There are a number of reasons for that. Year after presidential election year shifts of primary elections are not all that common. But the proposed change probably had something to do with the stalled progress of SB 33 as well. The proposed February timing obviously violates the national party rules on presidential primary scheduling. That would have made national convention delegations from the state vulnerable to penalties reducing the number of delegates. Such a shift into February would also have placed the primary in the middle of the state legislative session, forcing state legislators to campaign for their own renominations during the session. Primary scheduling around legislative sessions remains a hang up for many states with consolidated primaries. That confluence of factors derailed this bill from the start. They have not been typical in the post-reform era, but there have been some. Notably, the Colorado/Utah/Wyoming subregional primary in 2000 fell on a Friday. But under the current national party rules, a hypothetical second Friday in February West Virginia primary would fall just three days after the New Hampshire primary position carved out in Democratic Party rules. That would violate New Hampshire state law. 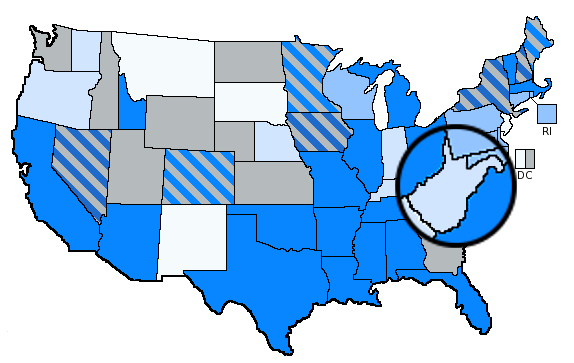 1 No, West Virginia is not exactly part of the South, but when the Southern Super Tuesday of 1988 was forming, West Virginia moved up, too, but only back to its traditional position in May from early June. The West Virginia bill has been added to the FHQ 2020 presidential primary calendar. During the 2017 Texas state legislative session, Rep. Lyle Larson (R-122, San Antonio) once again introduced proactive legislation to move the presidential primary (and all others that are traditionally consolidated with it in the Lone Star state) to the fourth Tuesday in January. HB 3180 would have had the same effect as the legislation Larson authored in 2015. And it ended up in the same place: on the sidelines as the legislature wrapped up its business. This is a fun one because the committee discussion around it neatly encapsulated the thinking of many frontloading era state legislators. That basically amounts to "Why do Iowa and New Hampshire get to have all the fun? Why can't we jump on that bandwagon too? Or have our turn in the first-in-the-nation spotlight?" For years it was enough for states -- state legislators and state legislatures -- to move up and cluster their primaries and caucuses on the earliest date allowed by the national parties. There were exceptions -- the attempted Delaware incursion on New Hampshire's turf in 1996 comes to mind -- but the early states were able to maneuver around that threat and watched most states file in behind them, clustered on the first Tuesday in either February or March (depending on the cycle and the rules). That changed in the 2008 cycle when Florida and Michigan, two larger states, pushed their presidential primaries into January and forced Iowa and New Hampshire to the cusp of 2007 contests. The January 15 position Michigan carved out for its primary left just enough space on the calendar to fit New Hampshire in a week before on January 8. However, Iowa had to violate its own eight day buffer and settle for a January 3 date to avoid pushing into 2007 (and the end of year holiday season). In other words, the early states got pressure from both ends: Florida and Michigan on the back end and the new year on the front side. But a prospective Texas move to the end of January would be different (in isolation) from the provocative maneuvering of Florida and Michigan of 2008. Such a move would not -- as Larson suggested during the public committee hearing for HB 3180 -- be the opening move in a negotiation that would lead to Texas being the first primary. Rather, an end of January Texas primary would lead to much the same result as 2008. It would leave enough space in 2020 to fit the four carve-out states in with a squeeze similar to 2008 between Iowa and New Hampshire. Of course, the national party rules have change since then to avoid just this sort of scenario. Importantly, the Republican Party added a super penalty to curb timing violations like the one Larson raised in this legislation; one that would penalize a January Texas primary by reducing the Republican delegation from the Lone Star state by over 90 percent. That complication was something voiced by Eric Opeila of the Republican Party of Texas when spoke against Larson's bill in the public hearing. In fact, as was the case with Larson's 2015 version of the same bill, all those who rose to speak on the bill spoke against it. While all of the witnesses continued to voice opposition to the 2017 bill moving the primary to January, unlike 2015, they all universally offered sympathy for the cause: disrupting the early primary calendar. Despite the unanimous opposition from those who spoke -- from both major state parties and election administrators -- in the public hearing, HB 3180 was unanimously passed by the House Elections Committee with a "do pass" recommendation. In fact, when it was re-introduced for that committee vote, Larson's bill was called "the flamethrower" before the committee chair said, "Let's send a message." That was a departure from the 2015 bill which was ultimately bottled up in committee where it died. The 2017 version met the same fate, but not before advancing from committee to the calendar for floor consideration (where it died). That marks an incremental change from 2015, the end point of which would likely be replicated in 2019 should another version of this January Texas primary bill be introduced. And in the end, the benefits are clearly outweighed by the costs; in penalties and position. Texas would move up only to see the carve-out states shift up and past it leaving the Texas primary penalized and still in the fifth position it currently shares with other states on Super Tuesday. Democratic National Committeewoman Kathy Sullivan said she expects a correction will soon be made to the DNC Rules and Bylaws Committee’s proposed 2020 schedule of early caucus and primary states to ensure no conflicts are on the horizon. Sullivan said that due to a clerical error, the draft discussed at the meeting two weeks ago set up a potential conflict between New Hampshire and Nevada – not unlike a major controversy that erupted on the Republican side in the fall of 2011 prior to the 2012 primaries and caucuses. “It was a mistake,” she said after conferring with DNC officials. “Everyone now understands and it was the intention that the calendar should be the same as it was in 2016.” In that year, the New Hampshire Primary was held on Feb. 9 and Nevada followed until 11 days later, Feb. 20. Placing Nevada just four days after New Hampshire in the proposed Rule 12.A was something FHQ raised in the aftermath of the DNC Rules and Bylaws Committee meeting in early May where the group adopted a framework for delegate selection rules in 2020. The fix is likely to occur when the RBC reconvenes in early June to finalize recommendations for changes to the delegate selection rules and call for the convention. It is strange what does and does not pick up steam on social media sometimes. When late last week I flagged the Astead Herndon article in the New York Times updating the Democratic efforts to finalize rules for the 2020 presidential nomination process, I was doing so more for personal reasons. As I explained in the remainder of the thread, I was more interested in bookmarking the article because there were several notes in it that deserved some attention if not pushback. The window of attention was much more immediate for FHQ, then, than it was seemingly taken by most. Again, whereas I meant to relatively soon get back to what I see as the flaws of the NYT piece, most took it as FHQ flagging the proposed rule change -- specifically the scaling back of superdelegates -- for a time, far down the road, when the unintended consequences of the change will potentially be felt. 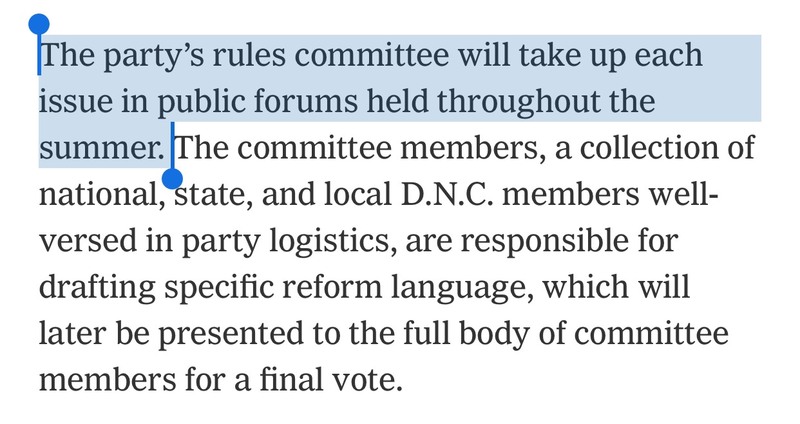 But the thing is, that overall story has not changed -- the DNC Rules and Bylaws Committee continues to consider what it will do with respect to the 2020 rules in general and specifically regarding superdelegates -- and the NYT story does not really add much to that. That is not to suggest that the story adds nothing -- it does, which I'll note below -- but it is mainly superfluous to items reported before or in the immediate aftermath of the Rules and Bylaws Committee meeting on May 8-9. Look, if one thing is a constant around here at FHQ it is that changing the rules changes the game. FHQ's mission has almost always been to not only detail how and in what ways the parties are altering their presidential nomination processes, but the impact those changes do and do not have on how those processes arrive at a conclusion; a presidential nominee. We remain far removed from the ultimate opportunity to assess whether specific rules changes for 2020 will lay the groundwork for unintended consequences in 2020. After all, we do not yet know what the final rules will look like (and will not until probably August). What remains somewhat clear this far out, however, is that the combination of a backward looking, 2016-tinged fight over superdelegates ahead of a 2020 cycle that looks like it will produce a large field of candidates is potentially mismatched. Reducing the role of superdelegates in the evolving primary season delegate count runs the risk of straining the math of that proportional allocation process. If enough candidates survive a long enough period into primary season, and if those candidates are qualifying for delegates -- hitting 15 percent of the vote statewide and/or at the congressional district level -- then the likelihood of some candidate receiving 50 percent of the delegates plus one to clinch the nomination shrinks. But those are big ifs as of now (and worth a separate post from FHQ at some point). Big because we do not yet know what the final contours of the rules will be and big because it remains early, early enough that there is still a ton of uncertainty involved in how the process will progress for Democrats over the next couple of years. I have a few thoughts that are best dealt with through some annotations alongside the passages in the piece. Following a lede that reestablishes the lingering divisions in the party after 2016 and a brief description of its symbolic cornerstone -- the superdelegates' role in the Democratic nomination process -- Herndon lays the groundwork of a compromise for 2020. This is not wrong, but it is a timeline truncated enough to be misleading. The true compromise on superdelegates between the Sanders and Clinton camps, it could be argued, happened back in December when the Unity Reform Commission (URC) finalized its recommendations to the Rules and Bylaws Committee (RBC). Those suggestions included a couple of options for scaling back the influence of superdelegates, and in the time since, a third option to more comprehensively reduce the role of superdelegates has been entertained by the RBC. 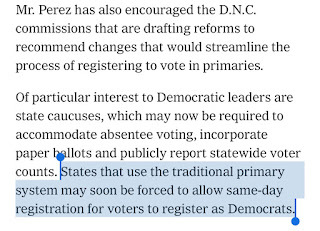 But Zogby alleges that the rules and bylaws committee chosen by Perez is stacked against the Sanders-aligned reformers. There is, then, an inside-outside dynamic involved. It is not that the Sanders faction cannot continue to lobby the RBC to make changes consistent with the URC recommendations (or even more aligned with their various stances), but they are doing so from outside the Rules and Bylaws Committee. The RBC has its own divisions/differences that do not so easily fit in that Clinton-Sanders compromise narrative. The committee is balancing a number of overlapping interests. Herndon then jumps into some specifics on the superdelegates proposals. Look, I have been guilty of using this description, too. It is easy on social media in particular. However, it should be said that there is no plan to eliminate (or later in the section on Donna Brazile, "eradicate") superdelegates. This is a semantics issue, but well worth a mention. There are two things that make superdelegates super. First, they are granted automatic delegate status. Elected officials, in other words, do not have to run against rank-and-file members of the party -- often their constituents -- for national convention delegate positions. That is no small thing. Having those automatic delegates means there are more delegate slots for the grassroots member of the party. The second feature that gives superdelegates something super is their unpledged voting status on the presidential nomination vote. Throughout the superdelegates era (1984-present) in the Democratic presidential nomination process, superdelegates have not been tethered to specific candidates based on the voting in primaries and caucuses. Rather, they have been free to choose to align with a particular candidate (or to choose not to) for any reason or combination of reasons of their choosing. The only area in which the potential reforms seek to affect superdelegates is on their unpledged voting status on the presidential nomination vote. And even then, the effects extend to just the first ballot and to (in two of the three cases) a fraction of the total number of superdelegates. FHQ tries to use the same "revise the role and reduce the perceived influence of superdelegates" description from the March RBC interim report adopted by the DNC. It can be a mouthful and not particularly well-suited to social media, but does accurately describe what is on the table. Let's quickly dispense with this one. There is no forcing here. Yes, the URC discussed at length different ways to encourage increased participation in the nomination process. And while some of those meetings included talk of requiring states to make such changes to registration rules or whether unaffiliated voters should participate, the reality is much easier said than done. Much of the language coming out of the current RBC meetings and likely to make it into the ultimate delegate selection rules in 2020 is more about encouraging states to move in these directions where feasible. And this is made clear in the primaries section of the RBC interim report. This is a minor point, but Herndon lays out the path ahead for rules changes toward the end of the piece. But in so doing, he makes it sound as if the RBC has a number of public meetings ahead, peppering the summer months. The committee will meeting in conjunction with the June DNC Executive Committee meeting where the group will dig into the 2020 Call for the Convention (which includes some specifics on delegate apportionment and allocation) and seek to finalize the superdelegates and party reform sections of the URC recommendations. That is a long list, and even though the timing may extend beyond the URC/convention-mandated window for RBC consideration of the URC recommendations (end of June), an additional meeting in July may be required to deal with it all. If past is prelude, then the DNC will adopt the 2020 rules as it has tended to in August. 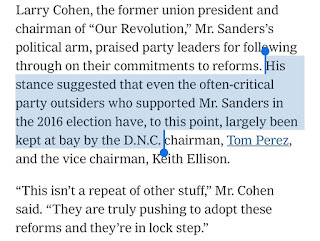 Rather than indicating a sense of continued division, the former head of Our Revolution painted a picture of a leadership team at the DNC that is pushing forward and advocating for the reforms called for by the Unity Reform Commission. FHQ would add that the Rules and Bylaws Committee has had a measured and open consideration of the URC recommendations that has stretched beyond and not simply rehashed the Clinton-Sanders divide. Maintaining a balance on that front has been a thread throughout, to be sure, but there has been a thorough consideration of the practical implications of rules, rules changes, implementation, and unintended consequences. As always, the proof is in the pudding on these things. Keeping folks "at bay" during rules discussions is one thing. Doing so after the rules are set in stone may be another altogether. There is no official whip count on these things. If there was it would be fluid and very much unofficial. The RBC is going to aim for a set of recommendations that is as close to unanimous as possible. This is the same principle FHQ discussed here with respect to how the RBC would deal with the URC recommendations. Unanimity means consensus, and consensus adds pressure to the next group considering recommendations. Any division is more likely to lead to a maintenance of the status quo. In other words, tweaks will be made to ensure that the RBC is as close to on the same page as possible. One could glean a sense of that tweaking process in Brazile's comments laying down a marker on the proposal to completely remove superdelegate voting rights on the first ballot of the presidential nomination at the national convention. Parsimonious though that proposal may be, there is certainly going to be resistance to the idea within the DNC. That is not any breaking news alert. And Brazile is not alone in that resistance among the members of the RBC. But that idea is out there. We further know that there are pockets of support and opposition to the other two options; those from the URC. RBC member, Elaine Kamarck, has voiced some opposition to the pooled vote plan. The Congressional Black Caucus has as well. That points the process in the direction of the alternate vote option. That is the messiest, most complicated proposal of the bunch, and those complications are often enough to drive RBC members in the direction of the more elegant option Brazile opposes above. The bottom line is that the RBC is in the midst of a balancing act on superdelegates that will ultimately produce some recommendations -- on superdelegates and other rules changes -- for full DNC to consider in August. The only thing on superdelegates that is clear at this point is that leaving them untouched is not on the table at this stage. 1 These latter options are not all that likely to happen. There are a number of political reasons neither would. However, such hypothetical votes are absolutely something on which the full convention could vote. For much of the post-2016 period, FHQ, in looking ahead to the 2020 cycle, has often raised the caucus-to-primary shifts in Colorado, Maine, and Minnesota. All three formerly caucus states in various ways laid the groundwork in 2016 for 2020 presidential primaries. But that trio of states is not alone in the switch. In its 2017 session, the Utah state legislature passed legislation -- which was ultimately signed into law -- to provide for a state-funded and run presidential primary option in the Beehive state for the 2020 cycle. And the motivation for HB 204 was borne out of the chaotic Utah caucuses of 2016 the turnout of which overwhelmed both parties in the state. Both the primary sponsor of the bill -- Representative Patrice Arent (D-36th, Millcreek) -- and others providing testimony in committee hearings for the legislation recounted stories of long lines, lack of parking, and understaffed caucus locations in both parties' processes. That prompted Rep. Arent to introduce the bill to "leave running elections to the experts -- our state elections office and the county clerks. Because political parties should be in the business of winning elections, not run[ning] them." While that sentiment was not exactly shared by the two political parties in the state, both the chairs of the Utah Republican Party, James Evans, and the Utah Democratic Party, Peter Carroon, voiced support for the move. Evans, in particular, supported the state providing for a presidential primary election, but leaving it up to the state parties to opt into using the election as a means of allocating national convention delegates. The state did not fund a presidential primary in either of the 2012 or 2016 cycles. It did for 2012 give parties the option of using the June state primary for expressing presidential preference to allocate delegates. The Utah Republican Party opted into in that June primary in 2012, but its late June date was non-compliant (too late) with both parties timing rules in 2016. A failed effort to move (from February to March) and fund a separate presidential primary in 2016 occurred in the same winter/spring 2015 time period that the Utah Republican Party was signaling an inclination to conduct the delegate allocation/selection process through a caucus/convention system. For 2020, Utah Republicans, with it uncertain to unlikely that President Trump will face any competition for the Republican presidential nomination, will retain the ability to hold caucuses. However, both state parties will have the ability to avoid the caucus chaos of 2016 with an option of a state-run 2020 presidential primary. The state will put up some funds for the primary, but local/county governments will seemingly bear the brunt of most of the costs. What is and was left unclear in 2017 effort to fund a 2020 presidential primary is when that primary will be held. Currently, state parties have two options on that front. The Western States Presidential Primary is scheduled for the first Tuesday in February. If and only if that option is not funded by the state -- and it was not in either 2012 or 2016 -- then the state parties can opt into the late June state primary. But neither date fits into the window -- first Tuesday in March to mid-June (different June cutoffs for both parties) -- allowed by the national parties for states to conduct their delegate selection events. That means that with the funding now there, the Utah legislature will have to revise the date of the 2020 presidential primary during its 2019 session. It should be noted that the legislation -- HB 204 -- signed into law funds/requires a "presidential primary", but not the Western States Presidential Primary specifically. Now, that requirement does appear in the Western State Presidential Primary section of the Utah Code, but is not exactly a requirement for that February contest. FHQ raises this uncertainty with respect to its treatment of the Utah presidential primary on the 2020 presidential primary calendar. The Utah legislature will set the date in 2019, and for now, FHQ is categorizing the primary in the Beehive state as having no date (due to the lack of clarity in the code). It is a fine distinction, but FHQ categorizes Utah as in need of setting a date and not in need of changing a non-compliant date. The Utah law has been added to the FHQ 2020 presidential primary calendar. Update (5/24/18): The Rules and Bylaws Committee appears poised to alter the proposed rules change to bring the timing of the early states roughly in line with the calendar from 2016. This past week as the DNC Rules and Bylaws Committee (RBC) reconvened to begin adopting a draft of the 2020 delegate selection rules, it quietly tackled the basic structure of the primary calendar. Seemingly, nothing out of the ordinary occurred. Even at the time the RBC was considering Rule 12 (Timing of the Delegate Selection Process), FHQ remarked on how the privileged positions of the carve-out states, a controversial topic at RBC meetings in past cycles, took a backseat to a proposed amendment to another section of the rule. After a reading of the full text of the short rule, then, the committee moved into a discussion that had little to do with Iowa, New Hampshire, Nevada, and South Carolina. But the language of the adopted Rule 12.A is worth some time. No meetings, caucuses, conventions or primaries which constitute the first determining stage in the presidential nomination process (the date of the primary in primary states, and the date of the first tier caucus in caucus states) may be held prior to the first Tuesday in March or after the second Tuesday in June in the calendar year of the national convention. Provided, however, that the Iowa precinct caucuses may be held no earlier than 29 days before the first Tuesday in March; that the New Hampshire primary may be held no earlier than 21 days before the first Tuesday in March; that the Nevada first-tier caucuses may be held no earlier than 17 days before the first Tuesday in March; and that the South Carolina primary may be held no earlier than 10 days before the first Tuesday in March. 1. First, if you are from New Hampshire, then you probably picked up on this when you saw the calendar at the top. A Nevada caucus just four days after the New Hampshire primary -- if Nevada Democrats opt to hold their precinct caucuses as early as the rule allows -- is a potential violation of the New Hampshire law requiring the Granite state primary to be at least seven days before any similar contest. Now, I hear you. Who cares about New Hampshire's state law? Well, Granite state residents in general and Secretary of State Bill Gardner in particular care.1 And the latter would likely act in accordance with the law to protect the seven or more day buffer between New Hampshire and any other state (with a similar contest). That is what Secretary Gardner has done since the primary scheduling responsibility was granted to the New Hampshire secretary of state's office in 1976. 2. While any looming New Hampshire versus Nevada showdown over 2020 primary and caucus scheduling gives FHQ flashbacks to October 2011 -- the last gasp of 2012 calendar chaos -- it does not mean a similar fracas will break out in 2019. At this point it all hinges on at least a couple of different inputs; one similar to the 2012 cycle and one different. While there were efforts to further clarify the similar election phrase back in 2010, they did not go anywhere in the legislature. And that left in place a law that affords the secretary of state some latitude in defining and determining what a similar contest is. Is a caucus a similar election? Technically, yes, but over the years some distinction has been made about delegate selection. In fact, the proposed change to the law in 2010 defined that distinction, exempting from inclusion as a similar contest any caucus or contest that (directly) selects delegates to the national convention. But that only gives some insight into the thinking of some in the Granite state, not where it matters. The secretary of state ultimately makes that determination, and Gardner has always played it close to the vest where the primary date is concerned. Was Nevada a similar contest in 2012? The secretary certainly implied as much in the game of brinksmanship with the Nevada GOP. But Gardner was taking advantage of a power almost unique to New Hampshire. There is one decision maker behind the primary date, and he or she can wait and has waited longer than any other state to settle on a date when conflicts arise with other states. Gardner knows this. The national parties know this. That was part of the reason why it was the Nevada Republican Party that got pressure from the Republican National Committee to back down from the the 2011 fight and opt for a date not just four days after the New Hampshire primary. Note, however, that in the 2020 context, it is the Democratic National Committee and not Nevada Democrats potentially behind any such conflict between New Hampshire and Nevada. The national party is the actor setting the parameters for contest date selection. In the dust-up with Florida and Michigan that cycle, New Hampshire pushed up more than Nevada did to defend its first-in-the-nation turf. Nevada Democrats were not willing to move up and actually followed the Rule 11. Of the four carve-out states, Nevada was the only one on the list that ended up on the date described in the rules-based calendar outline above. Four years later, the DNC made adjustments to that calendar outline. Not only did the party push back the pre-window portion of the calendar from January to February, but also flipped Nevada and New Hampshire in the 2012 version of the then-Rule 11 relative to 2008. That calendar should look familiar. Other than the South Carolina part, this is the exact spacing between the first three contests as is proposed for 2020. Nevada was supposed to have been just four days after the New Hampshire primary. Again, however, Florida, as it had in 2008, upset the applecart for 2012. When the Sunshine state scheduled its primary for January 31 that did not leave enough calendar space in which to schedule all four carve-out state contests 1) with the spacing state actors in those states preferred, 2) on the preferred days those four state customary hold contests, or 3) in line with the DNC calendar rubric above. But what 2012 did produce was a rough model for the DNC to follow for 2016.2 Basically, Iowa, then New Hampshire eight days later (as prescribed by Iowa law), followed by Nevada on a Saturday outside of New Hampshire's seven day buffer (again as prescribed by New Hampshire law) and with South Carolina bringing up the rear a week later than Nevada, also on its typical Saturday. 3. So what is driving the change to that 2016 model for 2020? What changed? Why change anything if the spacing is just right for the carve-out states? The short answer is that that spacing is not just right for the four carve-out states. To explain this scroll back up to the adopted Rule 12.A above and give it another glance. The DNC, then, codifies the positions of the pre-window states by tethering them to the point on the calendar when the window opens; the earliest point when all the other states can begin holding their primaries and caucuses. First is Iowa, 29 days before the first Tuesday in March. That is unchanged relative to 2016. New Hampshire is next, allowed to hold its primary no earlier than 21 days before the first Tuesday in March. That, too, is the same as it was in 2016. But while Iowa and New Hampshire retain the same positions on the 2020 calendar relative to both the (same) opening of the window and 2016, Nevada and South Carolina do not. Both of the other two carve-out states saw their positions relative to those two points -- the (same) opening of the window and 2016 -- move up by a week. Rather than holding its caucuses ten days prior to the first Tuesday in March (as was true in 2016), Nevada can now schedule its first determining step as early as 17 days before that point on the 2020 calendar. Similarly, South Carolina in 2016 was allowed to schedule its primary up to three days before the first Tuesday in March. But for 2020, Democrats in the Palmetto state can hold its primary up to ten days before that point on the calendar. Before looking at it too closely, FHQ just assumed that the change was based on a different combination of days and dates in 2020. But that was not it. There are four Tuesdays and four Saturdays in February; enough to allow a repeat in the spacing from 2016. That was not the driving force in the change, and that means that there was an active push within the RBC to make a change. To sandwich all four carve-out states into February and give each of the four the space they prefer from each other, one then ends up with something like 2016. But that clearly was not satisfactory to all those involved. While the four early states were provided enough of a buffer between themselves, the last contest -- South Carolina -- was not getting much space between it and the next round of contests; typically a big cluster at the point on the calendar where the window opens. And this point has been clearly, although implicitly, made throughout the RBC meetings this year. Former DNC chair and South Carolina member on the RBC, Don Fowler, has raised the California primary moving from June to March at nearly every RBC meeting in 2018. And typically Mr. Fowler's comments have hinted at doing something about that; about California (and all of its delegates) being so early. And California is not alone on that date. This is not the first time that California will have been so early on the calendar, but it will be the first time that the primary in the largest state in the country has coincided with the primary in the second largest state Texas. The list does not stop there either. Already there are eight states with contests on March 3, 2020 and with the two most delegate-rich states among them, that group is likely to expand. If you are an actor at the state level who wants your early contest to have maximum impact, then having a contest just three days prior to a likely huge cluster of contests is no way to do it. That is a good position if you want candidates to spend little time and even less money in your state before running for the nearest airport to jet off to some other state with more delegates at stake. That is why New Hampshire insists on the seven days between it and the next contest (not the preceding one): to maximize the impact of the contest on the shape of the race, but also to ensure that the candidates and their campaigns are not tempted to skip (or more likely minimize) the Granite state primary in favor of greener more delegate-rich pastures. However, in giving South Carolina its own buffer, the DNC is potentially encroaching on another state's insulation. Nevada has gotten pushed into New Hampshire's territory on the calendar, and the question remains, do actors in the Granite state -- specifically the secretary of state there -- see Nevada in that position as a similar contest? The DNC clearly does not see Nevada as a similar election. But if 2011 is any guide, then New Hampshire secretary of state Gardner is likely to see things differently than the DNC. Although, what is likely to be different in 2019 than it was in 2011 is that the calendar is unlikely to see any states outside of the four carve-out states force those states into January, much less close to pushing into late 2019. That potentially greatly reduces the pressure at the beginning of the calendar. New Hampshire may not threaten a move into 2019 in its own defense -- it would not have to -- but it could move up a week to give itself the at least seven days state law requires or two or three weeks if Iowa has already laid the groundwork for February 3 caucuses. Regardless, this general outline of a calendar from the DNC puts all eyes squarely on New Hampshire. What else is new? 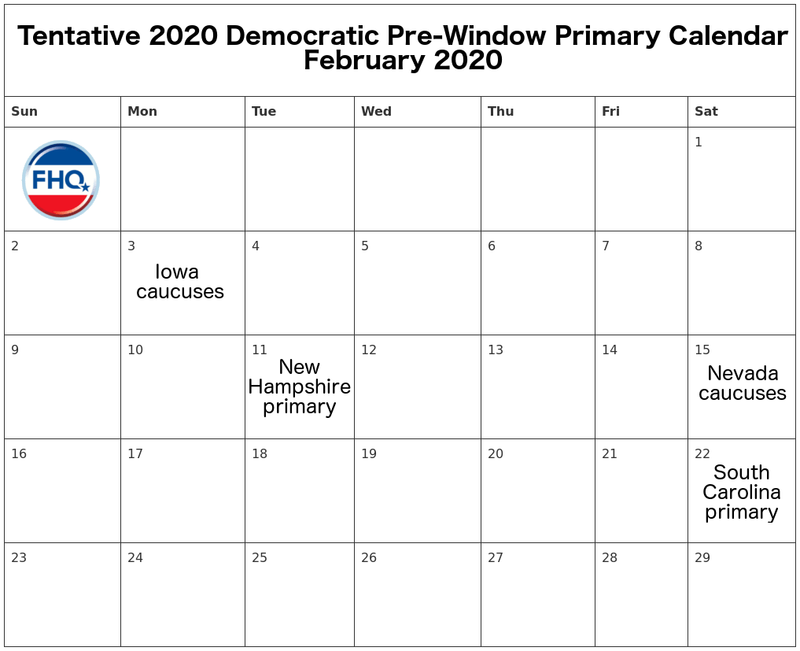 FHQ's 2020 presidential primary calendar has been updated to account for this proposed calendar. Tentative dates have been added for the four early states. 1 Yes, Gardner is facing a challenge in his bid to retain the secretary of state position this year, but Gardner or not in 2019, whoever is in that position is likely to do the same thing: keep the primary at least seven days ahead of the next contest. 2 FHQ says rough because Iowa was pushed to a Tuesday caucus in 2012 since it was forced up against the New Year's holiday. That meant Iowa was just a week before New Hampshire rather than the eight days it has preferred. On Tuesday, May 8, the Democratic National Committee Rules and Bylaws Committee (RBC) reconvened for its fourth series of public meetings of 2018. This meeting -- at this particular point in the cycle -- is typically the mark-up meeting. The RBC starts going through the delegate selection rules in sequence, offering proposed amendments along the way. The session on Tuesday pushed through much of the rule book that fits under the purview of the mission at FHQ. 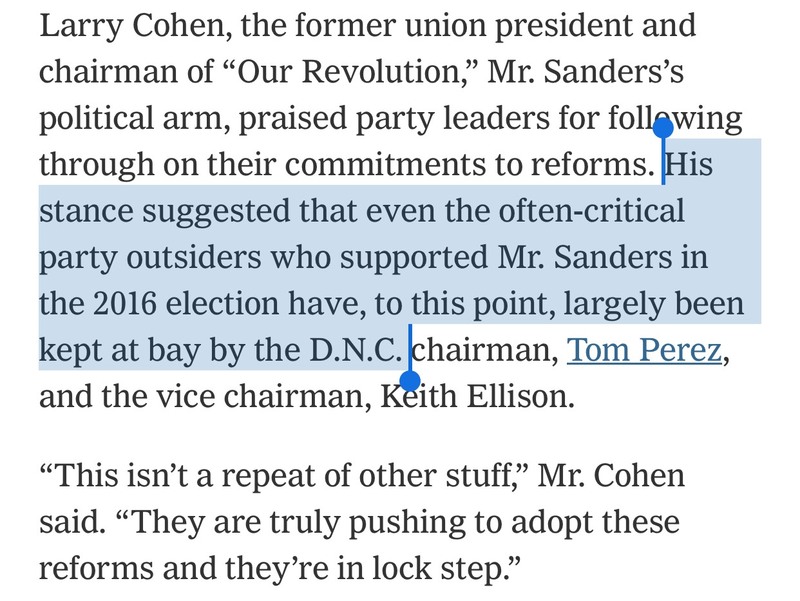 For example, while the RBC punted on the substance of the superdelegates question of the cycle -- the actual reduction of the role of the unpledged delegates -- but laid the groundwork for a change. It added a new rule, creating a new class of automatic delegates by breaking that group off from the broader group of unpledged delegates formalized in the old Rule 9. But there was an innovation to the DNC delegate allocation formula the RBC adopted yesterday that deserves some attention. 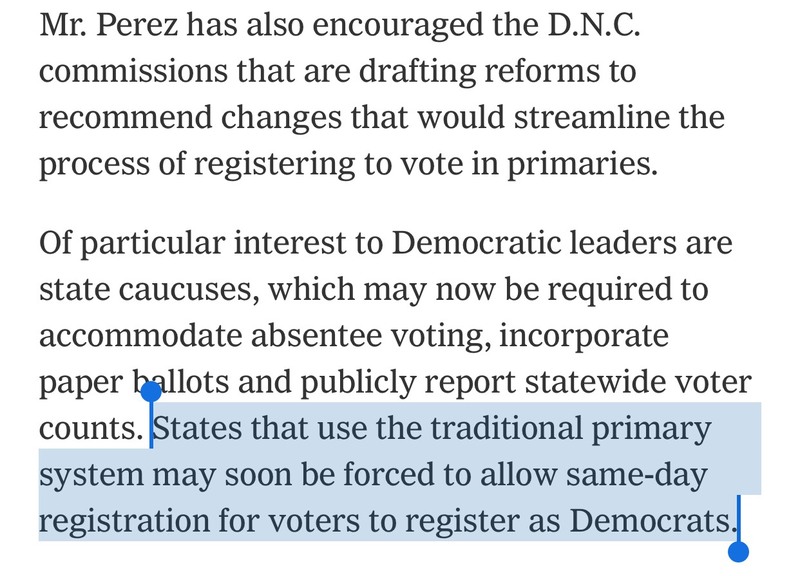 It is not that the change will have significant effects -- FHQ is skeptical of that -- but that it is a change to a formula that has been quite uniform across all states in the Democratic nomination process for years. How did the formula change? The RBC was on the verge of quickly dispensing with the new Rule 14 when co-chair Jim Roosevelt interjected to inquire if the committee was behind leaving the qualifying threshold described in Rule 14.F in place. Now, typically the threshold for qualifying for delegates is set at 15 percent. Those provisions for district delegates (Rule 14.B) and at-large and party leader and elected official (PLEO) delegates (Rule 14.E) are unchanged. Rule 14.F lays out the threshold in the event that no one gets a share of the vote at or above 15 percent. That has been set at within 10 percent of the frontrunner in past iterations of the rule.3 In other words, if the frontrunner receives 14 percent of the vote statewide, then all candidates who received between four and 14 percent of the vote qualify for a proportional share of the delegates allocated based on the statewide results. To mitigate some of the associated issues attendant to the formula in combination with a large field, the RBC devised an elegant solution. Under the 2016 Rule 13.F, there was a fixed 10 percent qualifying window under the share of the top votegetter. But the change for 2020 in Rule 14.F would make that qualifying window in the event that no candidate receives at least 15 percent of the vote more dynamic. The old fixed 10 percent window will become a bit more elastic, conditioned by what share under 15 percent the "frontrunner" gets. If the leading candidate wins, for instance, 12 percent of the vote, then all those candidates within six percent -- half -- of the top finisher would qualify for delegates. If the winner got eight percent, then all those within four percent -- those between four and eight percent -- would qualify for delegates. Again, while this is a fun little tweak that grabs the attention of delegate nerds, the change is very likely to have only marginal effects in a race with even a large field. Winnowing is going to happen with or without this change and the bulk of that process will take place in February during the pre-window period in which Iowa, New Hampshire, Nevada, and South Carolina will hold contests. That quartet is not a series of delegate contests, where accruing and counting up delegates is the goal for campaigns. Rather than delegate contests, the four early carve-out states are momentum contests in which winning is the metric that separates the wheat from the chaff. Even if the early states were delegate contests, there just are not all that many delegates at stake. Couple that with the fact that all of a state's delegates are not pooled and allocated together and it minimizes the impact of the allocation formula change even further. In other words, there is not one collection of delegates in a state allocated as a group based on the statewide results. Delegates are split into smaller subunits: at-large delegates, party leader and elected official delegates, and district delegates. These smaller, early states, then, already have small pools of delegates, but splitting their allocation up means that a proportional share of a subset of an already small share of delegates does not amount to all that much. Take New Hampshire, for example. There were 24 pledged delegates in the Granite state in 2016: five at-large delegates, three party leaders and elected official delegates, and eight congressional district delegates in each of the two congressional districts (16 total). Even if multiple candidates receive more than the typical 15 percent to qualify for delegates, there are only so many ways five at-large delegates can be proportionally allocated. After all, there are only so many delegates to go around. That principle is still true under the revised formula. However, where this altered allocation formula can be of some concern is in the event that there is significant clustering among candidates in the results in early states. How can winning be assessed if, say, ten candidates are all clustered not only under 15 percent, but within a few percentage points of each other? In that scenario, this new rule ends up being pretty arbitrary in its now more dynamic line of demarcation between who gets delegates and who does not. Truthfully, clustering or not, arbitrary or not, the order of finish will matter, and the next contest with come barreling down the pike to confirm in whole or in part the results from the previous contest of contests. This is probably entirely too much of a treatise on such a small rules change. In the end, the matter is the change of just a few words in one rule in a big book of rules. However, as an aside, something should be said about the action here on the part of the RBC. First, co-chair Roosevelt exhibited the power of suggestion that the chair can have in these proceedings. Again, the committee was seemingly ready to affirm the new Rule 14 and move on. But Roosevelt raised the issue and the can of worms was opened, and more importantly a rule was altered. That is neither necessarily good or bad. But it should be noted that it breaks the Democratic rules-making process from a pattern of fighting the last battle in which out-parties -- having just lost a presidential election if not the White House -- often find themselves. Instead, this small maneuver was forward looking; planning for the conditions of the next cycle rather than fixing the perceived problems of the last. That is no small thing, but in view of the 2020 rules making thus far, it is exception rather than rule. 1 What was interesting about the calendar discussion -- and particularly the controversial issue of the protected status of the four carve-out states -- was that no one raised the Iowa/New Hampshire question. In fact, section B of the new Rule 12 drew more of a discussion than section A, which deals with scheduling. Section B has required of states in the past that they begin and complete all steps of their delegate selection events in the calendar year of the presidential election. The rule specifically cites presidential candidate filing as an activity that falls into the delegate selection process. But that is also an activity that has stretched beyond the calendar year into the year before the presidential election. Functionally, that required of those states where that activity pushed out of the calendar year to petition the RBC for a waiver. In the new draft rules for 2020, there was a proposed change to the calendar year requirement that granted states the latitude to make those decisions without the worry of going through a waiver process. However, the members of the RBC balked at that change, questioning whether it gave incentive to states to push activities into the year prior the presidential election. Rather than go down that road, the RBC opted to return to the original language. In turn, that kept the calendar year requirement in place and continued to necessitate a waiver from states where state law deadlines may violate the rule. The intent of the change -- of alleviating the burden -- was more focused more on the RBC than the states. But the desire to avoid motivating states to make changes that pushed parts of their delegate selection events into the year prior to the presidential election outweighed the need to relieve any undue administrative burden on the RBC. The scope of states required to petition for a waiver for this purpose was not particularly widespread anyway. 2 The new description should clarified. That does not mean that a completely new rule was created. That did happen with the new automatic delegate rule, but in the rest of the cases above where new is used it means new numbering relative to how the rules were numbered in 2016. The insertion of the automatic delegate rule bumped all subsequent rules down a slot in the sequence. The 2016 Rule 11 on timing, for example, became the new Rule 12 for 2020. 3 "Frontrunner" in this case refers to the candidate who has received the most votes; the top votegetter statewide and/or in a district. 4 And if the top candidate garners 10 percent or less of the vote, then everyone who received a vote would qualify for delegates. There would be no effective threshold in that case. Just four years after it created the committee to sanction presidential primary debates, the Republican National Committee this past week at its 2018 spring meeting voted to strike the rule from its rulebook. There are a couple of points that FHQ would raise both in reaction to the rules change and the coverage it has garnered. On the rules change itself, some context is in order. Often FHQ talks of the national parties fighting the last battle when it comes to fashioning their delegate selection rules for a coming presidential nomination cycle. Indeed, the modus operandi of the national parties has tended to be "if it ain't broke, don't fix it," which is necessarily backward looking. The national parties look back to the most recent evidence they have on how well or how poorly the system is working and attempt to make corrections to address any shortcomings for future cycles. The Democrats' efforts in assembling their rules for the 2020 cycle are littered with examples of this. 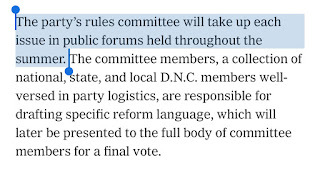 But it should also be said that the very creation of Rule 10(a)(10) -- the 2014 rule then known as Rule 10(h) that created the Standing Committee on Presidential Primary debates -- also fits this mold. Coming off a 2012 cycle that saw 20 debates, the Republican National Committee was intent on reining in not only the number of primary debates but also in creating some oversight for state party/media partnerships for those debates. The solution was the creation of a national party entity to sanction official Republican Party debates. Again, that action fits the pattern. Fixing a perceived 2012 problem for the 2016 cycle. However, the vote at the 2018 RNC spring meeting to eliminate the debates committee broke with that pattern. Rather than fixing a problem from 2016, the RNC is seeking instead to proactively plan for the 2020 renomination of an incumbent Republican president. And the rationale is simple enough: Why have a debates-sanctioning committee when the party is lined up behind the current occupant of the White House? At least that is part of the rationale. Another is that this has been widely viewed as an effort by the Republican National Committee to protect President Trump from would-be 2020 Republican challengers. This, too, is something a break from the norm. The predominant pattern for nomination rules creation in the post-reform era has been for parties out of the White House to attempt to tinker their way back in; to put together a process that ideally will produce a candidate well-equipped to defeat the incumbent president. That leaves the party in the White House to, more often than not, rest on their laurels when it comes to its nomination rules. The motivation -- the urgency -- just does not exist in the same way that it does for the out-party. First, presidents, in a position over their national parties, tend to like the process that nominated them in the first place. But the typical inactivity or minimal activity from in-parties is also a function of the fact that incumbent presidents do not often see challenges to their renomination. And when those challenges have materialized, there has not been much evidence of the parties maneuvering to protect their presidents at the rules-making stage of the cycle. Republicans at the 1988 Republican National Convention, for example, were not planning ahead for a future that included a 1992 Pat Buchanan challenge to the presidential candidate they were nominating. The party's concern then was more about lining up behind Vice President Bush. Bear in mind that at that point in time Republicans set their rules for the subsequent cycle at the preceding convention. There was no rules-making infrastructure in place then to amend the Republican rules of the nomination process outside the convention. Nor do we see much evidence of the Democratic National Committee moving to protect President Carter ahead of the 1980 cycle. That is the only other time in the post-reform era where a sitting president had either persistent chatter about a challenge to his nomination or an actual challenge. Now, there were rules changes that the Democratic Party made for the 1980 cycle, but the motivation behind those rules changes was not exactly to protect the president from a prospective Kennedy challenge. This was the cycle where the DNC formally added a threshold for candidates to qualify for delegates. Four years early, in 1976, the party had allowed states to add a qualifying threshold of up to 15 percent of the vote in a primary or caucus. Candidates who received less than 15 percent of the vote in those states (and the congressional districts therein) that set thresholds did not qualify for delegates. For 1980, the party made this a requirement. States were mandated to have some threshold, but had some latitude in setting it. Primary states could establish a threshold up to 25 percent, and caucus states could set a threshold as low as 15 percent, but no higher than 20 percent. On the surface, that looks like an attempt to protect President Carter. Yet, a threshold that low functionally only rewards an incumbent by warding off a minor challenge; nuisance challenges. Such a threshold potentially becomes beneficial to an incumbent in the case of multiple challengers as well. The more candidates who run increases the likelihood of candidates not qualifying for delegates. In the case of one major challenger, the threshold becomes a non-issue. One strong candidate is likely to meet that threshold anyway. 1980 was also the cycle that saw the innovation of the "window rule" in the Democratic nomination process. The intent was geared more toward keeping frontloading at bay and the calendar formation orderly by setting a second Tuesday in March through the second Tuesday in June "window" for states to conduct their primaries and caucuses. While the goal was focused more on state-level actions and protecting exempt Iowa and New Hampshire, a secondary motivation behind the window rule was to tamp down on the resources a prolonged process required the candidates and the party at all levels to expend. This rules change did not clearly benefit Carter in 1980. Finally, 1980 was also the cycle that witnessed the DNC banning the use of loophole primaries, where delegates are included on the primary ballot and directly elected (as opposed to being selected through caucus/convention processes with candidate input). That cycle stands out as the only exception during the early part of the post-reform era (the first 20 years) when the loophole primary process was permitted. Although insider candidates tend to be the beneficiaries in such systems, their usage at the state level in the early post-reform era was not widespread. It would not have affected things much more than at the margins. Both Carter and Kennedy could lay claim to being insiders in 1980 anyway and went on to basically split those contests. While the sum total of all of these 1980 cycle Democratic rules moves gives the impression of helping Carter in retrospect, in reality the maneuvering was consistent with those of a party in search of the "ideal" rules in or out of the White House. And during the early post-reform era, the Democrats were out more than they were in. Given that context, the focus can shift back to the present and the Republican rules for 2020. FHQ's reaction to the news that the RNC intended to drop the debates committee was less about that than it was to the idea that change was intended to protect the president. In fairness to those reporting on the 2018 spring meeting, there were members of the RNC would provided "protection" as at least part of the rationale for the move. Randy Evans, the Republican National Committeeman from Georgia, came right out and said, "Obviously this is intended to dissuade a primary challenge to the president." FHQ will not dispute that. The move certainly continues to send a clear signal that the Republican National Committee remains in lockstep with the president. Reminders of the clarity of that point emerge every time during the Trump era that the RNC has gathered for one of its seasonal meetings. But whether eliminating this committee protects the president is predicated almost entirely on the premise that President Trump would participate in any hypothetical primary debates. As with many things concerning this president, there is a great deal of uncertainty around that idea. We do not know whether Trump would opt into such a debate. In fact, there is a pretty good argument to be made that he would sit out any such event, not allowing the platform to any would-be challengers. If one falls on the Trump would not participate in primary debates anyway side of things, then eliminating this primary debates committee does not really accomplish all that much. If anything, it protects the Republican National Committee. It saves this standing committee from the obligation of NOT sanctioning any debates in the event of a challenge to the president. Imagine a time in 2019 after Republicans have hypothetically lost control of one or both houses of Congress, the Russia investigation has persisted (and Democratic oversight of the administration in that area and others has intensified), and a challenger to Trump's renomination -- let's call him John Kasich -- has emerged. Now imagine that this debates committee still exists, but the president has no interest in debating his hypothetical challenger. That committee is, by rule, supposed to sanction debates with input from the various campaigns. If one campaign wants to debate and another does not, then what is the committee -- the RNC -- to do? A party in such a position might be inclined to side with the incumbent president in that case and not sanction any debates. But it would have to turn a blind eye to the other campaign(s) and any following/resistance (to the president) both within the RNC and among rank-and-file Republicans to do that. That would be handing to that group the type of structural grievance that Bernie Sanders and his supporters used against the DNC throughout the 2016 process and into the 2020 cycle for that matter. Instead of going down that road, the RNC opted to get out of the debate-sanctioning business altogether for the time being.1 Again, that move continues to send a signal that the national party is behind the president, but the elimination of the debates committee is protecting the RNC more than it is the president. It eliminates a potential problem down the road before it materializes. And yes, in fairness, that may never have materialized anyway. But the RNC has that covered now regardless. 1 One alternative option the party could have pursued was a minor edit to Rule 10(a)(10). The standing Committee on Presidential Primary Debates could have been left in place but would only be activated in years in which there is no incumbent Republican in the White House (seeking renomination) or little or no competition for the nomination. Of course, those are tricky concepts to define that may end up slippery slopes back to the same sorts of problems the RNC would have in 2020 if the committee had survived. Eliminating the committee with the option of bringing something like it back at the discretion of the RNC chair should conditions change is the cleanest option. As expected, a bill that would have established a separate and earlier presidential primary in Nebraska quietly died when the legislature in the Cornhusker state adjourned in mid-April. While the bill -- LB 1032 -- received a hearing in committee, it failed to gain traction just as a similar effort did in 2016. The push in Nebraska is yet another primary movement casualty during the 2017-18 legislative sessions across the country. To this point, only California has successfully shifted the date of its presidential primary for the 2020 cycle. Every other bill in other states failed at some point in the legislative process. While the pace of 2020 primary movement has been slow thus far in the cycle, that is fairly common. Most of that activity continues to take place in the year before the presidential election year. Shifts happen during the other three years in a cycle, but it tends to be exception rather than rule.